The CLAHRC CP is a collaboration between the Cambridgeshire and Peterborough NHS Foundation Trust and the University of Cambridge in partnership with a wide range of Cambridgeshire and East Anglian health and social care providers (read more about our partners). 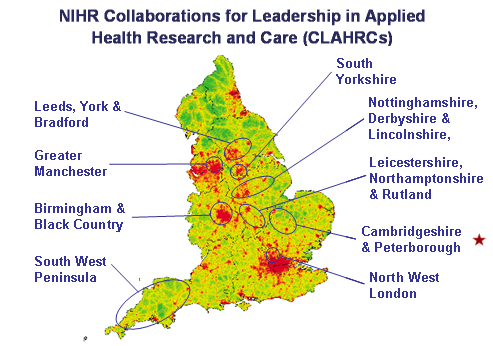 The National Institute of Health Research (NIHR) established nine Collaborations for Leadership in Applied Health Research and Care (CLAHRC) in 2008 to undertake high quality applied health research focused on the needs of patients and service users, and to support the translation of research evidence into practice in the NHS and social care. The CLAHRC CP’s research focuses on people with mental illness, intellectual (learning) disabilities, acquired brain injury, and care for those approaching the end of life. The CLAHRC CP is a multi-disciplinary and multi-agency project with the three clinical research themes cross cut by two implementation themes. Read more about our research and implementation themes. The CLAHRC CP is a multi-disciplinary and multi-agency project with the three clinical research themes cross cut by two implementation themes. Many strands of research are being undertaken, and all members of the CLAHRC CP work in a collaborative manner across the themes in a ‘virtual’ organisation. While the primary goal of the CLAHRC is the translation of research evidence into practice, in achieving this goal we aim to enhance the capacity of health organisations to do and use research, and to develop and establish robust and enduring links between the academic and service delivery sectors. We are doing this by providing opportunities, through collaborative partnerships and through programmes such as the CLAHRC Fellowship scheme for NHS managers and clinicians. CLAHRC CP is a true collaborative effort between the service providers and the university. Our central office is located at Douglas House, Trumpington Road, Cambridge.